It might be suspected to be an apocryphal story, but in fact it is one hundred percent fact. 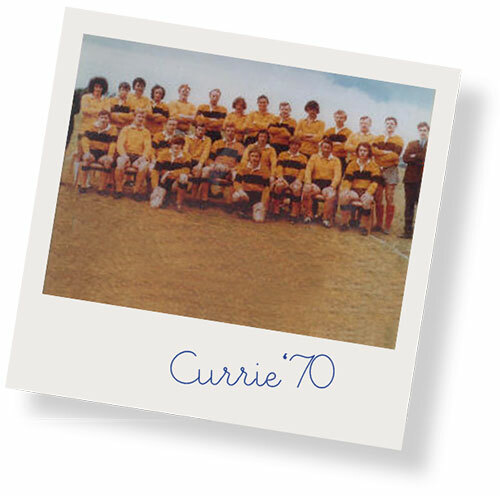 Currie Rugby Football Club – the home of Currie Chieftains – was founded on the idea of six men in a pub! Back when 1960s were quietly slipping into the 1970s, the famous six – Bob Kirkwood, Jack Hogg, Roger McLaren, Tom Chandler, David Bisset, and Alex Galbraith – noticed that fellow customers in their corner of the ‘Weavers Knowe’ always turned to the back page of the ‘Saturday Pink’, where the rugby – not soccer – scores were listed. From this small observation and the discussion that followed the idea of a Currie Rugby Football Club was born. Soon the ‘six’ were joined by Gordon Stewart and by Currie High School Headmaster Ronnie Paul. Together this group sent out posters and leaflets around the Currie, Balerno and Juniper Green area announcing an open meeting at Curriehill School to ‘discuss the formation of a local Rugby Club’. On the evening, by 7.25 pm there were barely a dozen in the room, but by 7.30 attendance had swelled to 35, and the show was on the road! So,it was agreed to form Currie Rugby Football Club, with the aim of ‘promoting and developing the game of rugby within the area for the benefit of the sport and the community’. The club was formally founded in April 1970 and in October that year a team was fielded to play Gala Wanderers at Gala in jerseys borrowed from Boroughmuir for the occasion. By January 1971, the club was fielding two XVs, and the following season a third began occasionally to appear. In 1973-74 the SRU restructured Scottish rugby. In place of the then unofficial championship it brought in a formalised and comprehensive league structure. This gave Currie RFC entry to Edinburgh District League, Division 2. Progress and promotion followed, albeit slowly at first. In a season when the club was unbeaten and scored over 1000 points, it eventually was promoted from Edinburgh District League Division 1 to the National League – Division 7! Step by step, the Club progressively worked its way up the National Leagues, with the skill and dedication of coaches Roy Mack and Lyn Tatham. and the huge contribution from more people than can be mentioned here. 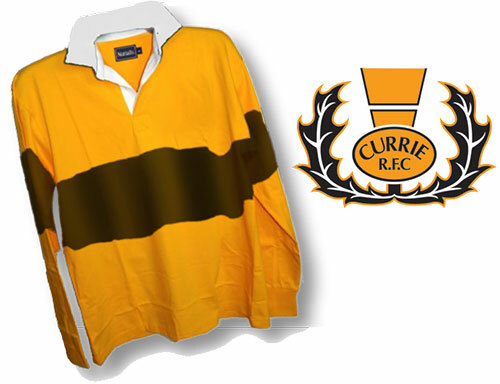 By 1983-84, Currie RFC was ‘resting’ in National League Division 4. Then, by one of those singular events which make history, former Scottish International wing three-quarter Graham ‘Greco’ Hogg (who had played and later coached with Boroughmuir) accepted the invitation to become Head Coach at Currie. Greco (who sadly died in August 2017) had the skill and experience of international rugby behind him, but he also was an outstanding coach and mentor. Driven by his skills and ambition for the Club’s future, there was quick promotion from the Division 4 and in quick succession from Division 3. The Club was now getting a good deal of publicity and soon was attracting players from other Scottish clubs and from overseas, whilst remaining the community club it has always been. The next few years were to see the club mature in a rugby sense and to face some of the most well-known clubs in the country. Finally, at the end of the 1989-90 season, the Club won promotion into the Division 1, some 20 years after it had been founded. By that time, the Club had established itself as a known destination for overseas players and, in additional to players from its region it was attracting players from many countries including New Zealand, Australia, Ireland, Spain and Italy. Moreover, it had relocated! In the early 1980s the Club realised it needed a ground and clubhouse of its own, so a long lease was obtained from Lord Rosebery on a beautiful piece of land, adjacent to Malleny Park, alongside the Water of Leith, in Currie’s neighbouring village of Balerno. As things would have it, the move coincided, with the proposal to build Balerno Community High School across the river. The Club’s lease became involved in the planning negotiations and, whilst sole use was lost, a compromise was reached which secured the land for the duration of the rugby seasons and also created the opportunity for the Club to build its Clubhouse at Malleny Park. This project was a live demonstration of the Club at its very best. The finance was raise and the building was done entirely through the members efforts. Those with trade skills undertook the building work, whilst the business managers, teachers and bankers in the club undertook the labouring tasks to which they were assigned. Whilst the new Clubhouse provided the necessary social areas for the Club, the changing rooms, were provided through a ‘park-block’ owned by the Council. However, a change in policy released them to the Club and in 1992 that building was extended to provide the changing facilities that exist today. By the beginning of 1997-98 season these developments had been further enhanced by the completion of an upstairs of the new extension, to provide the Malleny Lounge and by the addition of a small executive lounge, now the Rogerson Suite. After Currie RFC had been in Division 1 for three seasons, the SRU once again decided to restructure the leagues. At the end of 1994-95. Division I, was reduced from a format of 14 teams to a format of 8 teams. Regrettably, Currie was one of the 6 teams to go down. However, this was to be only for one season. Under the guidance of Bruce McNaughton, and with Ally Donaldson, by then 1st XV Captain, Currie came storming back to win promotion to Division 1. And, on 11 May 1996 at Murrayfield, the 1st XV ended a remarkable season by completing a ‘double’ beating Stirling County in the final of the Tennent’s Shield. To add to this, the 2nd XV also won promotion to Division 1 of the Inter-Cities 2nd XV League. Then in August 1995, the IRFB decided that the game should be go ‘open’ and become professional. So, in season 1996-97, Currie RFC was faced with the challenge of competing in this new part-time and full-time professional era. Characteristically the club responded to the new circumstances, and at the end of the season finished with its highest-ever position, third placed in Division 1 of the Premiership, behind Melrose and Watsonians. 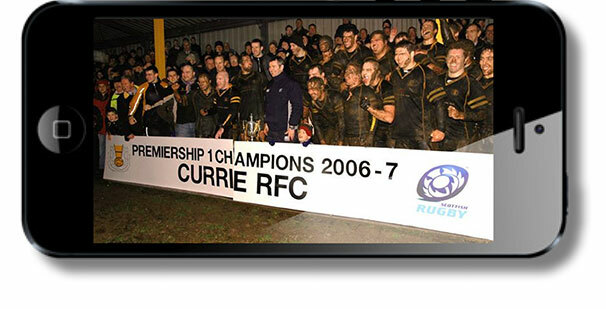 Moreover, the years that followed saw Currie RFC consolidate its position as a leading Scottish club. In 2005-06 the 1st XV reached the finals of The BT Cup, losing to Watsonians. Then in 2005-06, for the first time, the club became BT Premiership Champions – over 36 years from its founding it had risen from the bottom to the very top of the Scottish club rugby scene! What’s more, to underline the fact that it wasn’t a fluke, the club did it again, securing a second Championship win in 2009-10. Over the period, coaches have changed with Ally Donaldson and more recently Ben Cairns – both successful home-grown players in their time – taking the helm. But they have safeguarded the spirit and heritage of the Currie brand of rugby, determined and forceful when required but also open and free-flowing, with a certain panache. Following the Championship wins there were one or two lean years, when the club finished in the bottom half of the Premiership table. However, by the time the competition had restructured in 2014-15 to introduce a ‘top four’ play-off stage, Currie had rebuilt. In 2014-15, 2015-16 and 2016-17, Ben Cairns coach sides that made the play-offs in each consecutive year – and in the Currie tradition, they were resilient and competitive to the very last. Now, rapidly approaching the 50-year anniversary of its foundation, the Club has rebranded. In the 2017-18 season all its teams, from its high-performing BT Premiership side down to its youngest Mini-sides, will be rebranded as ‘Currie Chieftains’, embracing a new image for the modern era but one carrying forward the strength and traditions of the past. The Chieftains logos, motifs and tartan have skilfully been designed to honour the ‘original 6’ as the Club’s way of saying thank you to them and their colleagues who have done so much to develop Currie Rugby Football Club over the years. Likewise, the rebranding has stayed true to the widely recognized ‘black and amber’ themes. The new branding was launched at a Grand Chieftains Summer Ball at Murrayfield Stadium on Friday, 25 August 2017, but it is already reenergising the Club and raising its profile throughout the region and beyond. It has captured the enthusiasm of Club members, team fans and existing and new sponsors. It has provided a renewed drive and focus for the Club’s development, but it has also preserved the legacy of the past. Over the next three years Scottish club rugby is predicted to undergo a major transformation with a proposed league restructuring, which was announced at the Scottish Rugby AGM on 5 August 2017. The proposals will present challenging choices for clubs throughout Scotland. However, whatever the future holds, Currie Chieftains are looking forward not only to the Club’s 50 year- anniversary in 2020 but to the 50 years beyond. Famously, it is and will always remain the community rugby club founded on the idea of six men in a pub! 2000/01 Refurbishment of the lounge and opening of the Rogerson suite. Presenting us with an inspired opportunity to refresh our club brand. We now play under the name Currie Chieftains in tribute to those inspiring founders and supporters who contributed so much to our clubs creation in the early years.